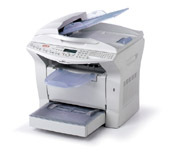 The B4545 MFP from OKI Printing Solutions is perfect for the hardworking small workgroup. This easy-to-use, affordable device, with its integrated design and robust feature set, promotes a smoother workflow and delivers outstanding value. It helps optimize your budget because you only have to purchase one device instead of many. And its small footprint lets you optimize your office space by using the room more efficiently.